It is a long drive from Brittany to Coventry, but at least we were on our own schedule for this part of the trip, so decided to split it over two days, with an extended stop on the first day. 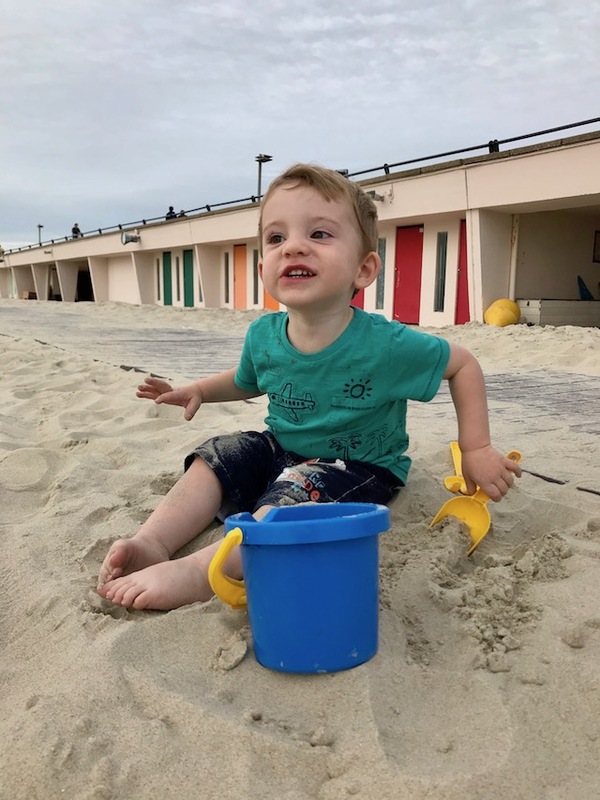 I had planned to stop in Honfleur, a lovely little fishing port, but realised that it wouldn’t be suitable for Owen, so decided to stop a few miles away in Deauville, so that Owen could run around on the beach and dig some holes! After another great breakfast, we said our goodbyes to Michel and Collette, my Mum’s cousins who had been hosting us in St Brieuc, and my parents, who were extending their trip with a few days in the Massif Central. We made plans to meet Simon and Sophie in Deauville, then set off, initially retracing our route from day 2. It took around three hours to get to Deauville. Owen only slept for the last hour, despite still seeming tired from his late night previously. There were a few traffic snarl ups around the Caen ring road, but we made good time and even managed to find a parking space right next to the beach. Ideal when you have a grumpy toddler who just wants to dig holes in the sand! Whilst Owen was building, then immediately destroying sandcastles, I went to find some ham and cheese baguettes for lunch. Deauville beach is really well set up, with a boardwalk, little cabins (named after Hollywood stars, who may or may not have visited Deauville) then little kiosks selling beach essentials – including lunch! After eating our baguettes we walked along the beach road, checking out the impressive old buildings. The Normandy Hotel, where my Mum used to work, was the highlight, with its half timbered exterior. We then walked back along the boardwalk, stopping for ice cream. I found my new favourite ice cream flavour – chestnut. I’m not sure where else I will be able to get it from again. Although I do know some chestnut farmers, so have got them on the case! Whilst we were eating our ice creams, Simon and Sophie turned up, so we spent some time with them whilst Owen played in the sand some more. When it was time to leave, he ran all the way down the boardwalk to the car – quite a long way for someone with such little legs! It was a good job he was tiring himself out, as we had almost another three hours of driving ahead of us. 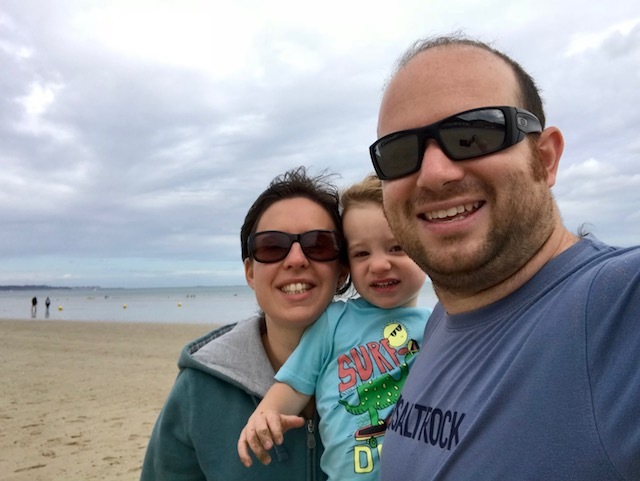 Our overnight stop was in Le Touquet, and we spent most of the drive looking out for tractors with Owen – he seemed way more impressed with them than the huge bridges we went over. As we were getting closer to Calais we noticed that most of the cars on the road were British registered, which I thought was funny. Not having been to Le Touquet before I wasn’t expecting to drive through pine forests on the edge of town and was pleasantly surprised to see that everything was really well set up for cycling. We were less impressed with our hotel, which felt really tired and due to a strange layout we were in the 153rd of 156 rooms down a really long corridor. At least the location was good – right on the beach! The town itself seemed nice though! We walked along the beach, past the wake boarding pool, the beach bars, kids clubs and volleyball courts to the town centre. I wasn’t prepared for just how busy the town centre would be – there were people everywhere, shopping, drinking and generally having a good time. As we were all pretty hungry, we went to the first place we found, a little pizza restaurant just off the main street. The pizza was amazing! I love that in France you can get pizzas with an egg on – quite a rarity in the UK. Owen was a bit of a monkey during dinner, I guess he had loads of pent up energy, after being cooped up in the car most of the day. So while Jen did some last minute shopping in town, I took Owen down to the beach for more digging! This is the photo at the top of the post. Once again, Owen enjoyed himself on the beach, hopefully two beaches in one day made up for all the time stuck in the car! The tractor and combine harvester conversations we had been having with Owen in the car must have been playing on his mind, as he work up at 5:45 asking about combine harvesters! We let him get into bed with us, forgetting that toddlers seem to have an inbuilt need to sleep perpendicular to anyone else in the bed. With only a tiny slither of bed to balance on, I didn’t manage to get back to sleep. At least this meant we were ready to leave early for the relatively short drive up to the Chunnel. When we got there we were given the opportunity to take an earlier train – result! Jen had never used the Le Shuttle, and was wowed by how seamless it all was. We were pretty much straight off the motorway and onto the train! Before long we were speeding along under the English Channel. 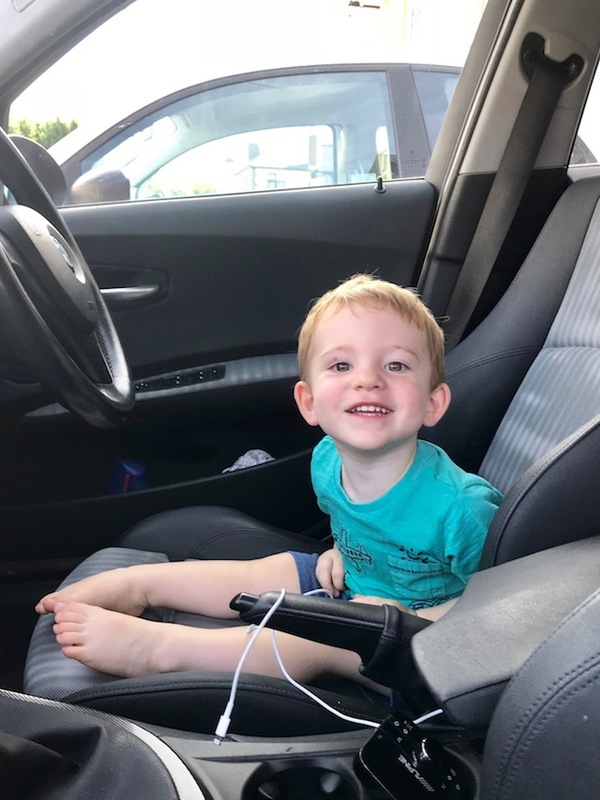 Whilst I was stretching my legs Owen took the opportunity to commandeer the drivers seat, thinking he’d get to drive the next leg of the journey. He was so upset when I put him back in his car seat. We’d worked out that it would only be a twenty minute detour to visit Jen’s sister, Heather, in Hackney. So as it was her birthday it would have been rude not to call in! I love the drive into east London, with the Canary Wharf skyline, Olympic Park and the O2, then through the 120 year old Blackwall Tunnel. At this time on a Sunday morning it was a pretty easy drive too. Owen was very excited to see Heather, especially as this was the first time he had been to her flat. We had brunch at the cafe around the corner from Heather’s flat. As I was in East London I felt that it would be rude not to have smashed avocado on toast (and of course post it to my Instagram story). 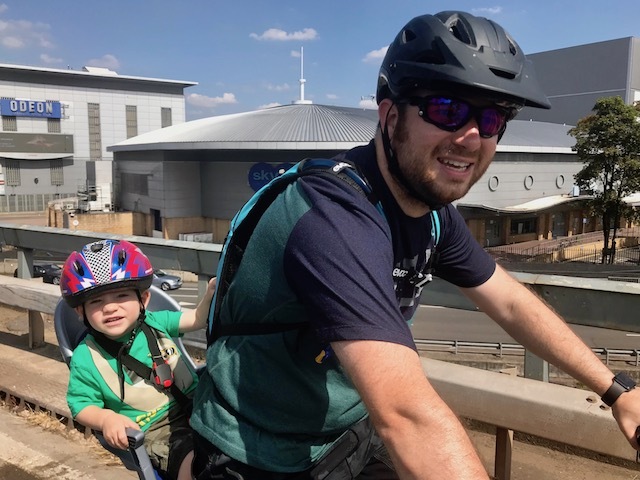 I was surprised at how easy it was to get from Heather’s flat to the M11 for the start of the final leg of our journey – two hours back to Coventry. I was back on familiar roads, and driving on the left, so it was the easiest drive of the trip. We were home by 14:00, exactly five days since leaving, having covered just over 1,000 miles!